The Yankees suffered the worst playoff loss in their franchise's history on Monday night, as they lost, 16-1, to Boston in Game 3 of the ALDS. Q. Aaron, what leads you to believe that this team will have a short memory and will quickly turn the page tonight? AARON BOONE: We've done it all year. It's one thing, I think, this group does a really good job of. Even times during the year when I'm a little frustrated at how we're playing, I feel like they're really, really good at letting yesterday roll off them and coming out and performing. I'm confident they'll do that today. Q. What went into your decision to go with Walker over Andujar and Gardner over McCutchen? AARON BOONE: Just wanted to get more lefty balance in the lineup tonight against Porcello. Feel like it makes sense to have that. Walk's played a number of games over at third, with CC on the mound too. Just feel like it gives us a little more balance in a matchup that makes some sense. Q. Obviously, it's a bit atypical to see a guy sitting on the Red Sox side the day after he hits for the cycle. From your vantage point, what factors are most important in figuring out lineup construction? How much do you believe in ideas like the hot hand and specific batter versus pitcher matchup histories? If you're kind of limited in your views of those, then what do you factor in? AARON BOONE: Wow, that's a lot. I mean, all those things are a part of the decision-making process that go in to making a lineup. I think, first and foremost, you try and -- I mean, you have a number of guys that are everyday guys that are pretty much going to be in there regardless of matchup. But then there's a handful of decisions where it comes down to matchup, left on left, left on right, this guy's skill set against a sinker ball or who's on the mound, what makes the most sense, defensive alignment. I mean, there's so many things that are baked into the cake as far as helping you make that decision. And how you weigh those kind of varies day by day. Q. Aaron, when you have a tough loss like last night and your decisions are in the center of the public conversation at least, do you process or decompress any differently than you would a loss where that's not the case? AARON BOONE: I mean, it's the postseason, so wins and losses, going back to being a player, I mean, there's such joy and excitement and relief on the days you win, and the losses are pretty much always complete gut punches and difficult and hurt. But in sport, in baseball, you've got to be able to get past it, learn from things, process all that happened, and get past it because the next day, the next play is so damn important. That's part of the game. Q. I guess just a follow on Ken's thing, Aaron. After last night you said in hindsight, yeah, because the moves didn't work, that maybe they weren't the best idea. Do you spend that much time that night second-guessing yourself or even this morning, or can you turn the page pretty quick on that stuff? 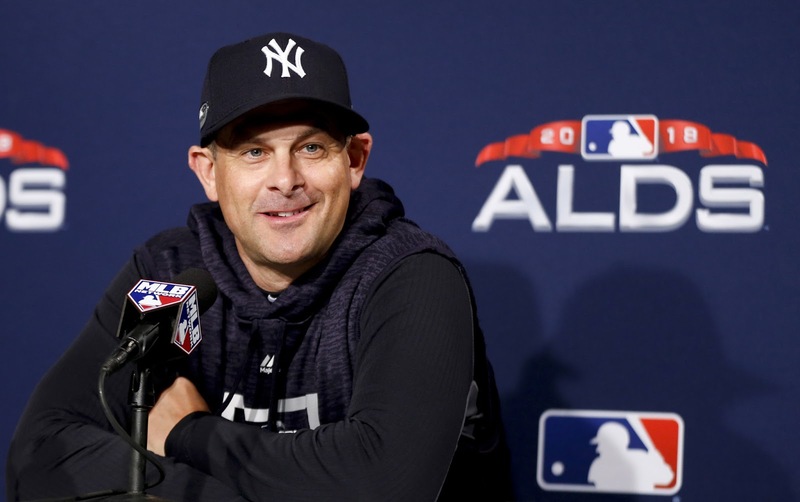 AARON BOONE: I think I do a pretty good job of turning the page, but you always kind of work through things or play out things differently. Because a lot of times decisions you make are not just black and white, this is what we're doing in this spot, they're decisions that you understand a couple of different ways you could go that makes some sense. So you kind of evaluate those and think about those and hopefully analyze always and kind of sharpening the process as far as those decisions are made. And then you move on and hopefully always continue to grow from things that have happened. Q. Aaron, aside from the start earlier in the year here, Rick had a lot of success against you guys in the regular season. What stood out to you about the way he attacked you guys, and how does the offense adjust to that tonight? AARON BOONE: He's been a really good pitcher in this league now for a long time. A guy that has command, that is able to pitch, especially as he's evolved through his career. He's a guy that can pitch on two planes. You know he's got that sinking fastball that's a factor. He'll cut it too, but he'll also work at the top of the zone with his four-seamer, mix in a good breaking ball. This is a guy that can really pitch, that has some versatility on the mound in the way he's able to attack different styles of hitters. And when he's on with that and with his command, he can be very tough. Q. I know it's mainly left hand bat in defense, but I wonder facing an elimination game, is anything about having Gardner in this game, how you feel about him overall and what he means to this team, putting him on the field on elimination night? AARON BOONE: No. No, it was -- this is probably something I've been kind of thinking about, we've been thinking about for the past couple of days, kind of looking at this matchup as probably a game where we might try to get a couple more lefties in. I could have seen Gardy playing in this game. You know, obviously, with Hicks going down for a couple of days, Gardy was in there anyway, but even before that, this is kind of a game potentially viewed as having both he and Walk in this game. Q. Aaron, in a game like this, an elimination game, is there any extra boost that the club gets from a guy with kind of CC's status on this team on the mound and the kind of chip he plays with? AARON BOONE: I think so, but I would also say our guys feel confident whoever we roll out there. So whether we're going out there with J. Happ or Masa or Sevy, they're all different in their own rights. Obviously, what CC is in that room is kind of the elder statesman, the leader, a guy that pretty much everyone in that room looks to and looks up to and admires. There's that. But I think all those guys in there, whoever we roll out there today, feel that we have a really good chance, and CC's no different. Q. So what do you have, obviously, I would think, a plan A, B, and C on how CC performs today? Because when you look at the length, he hasn't pitched beyond five innings much in a couple of months, and I think the last time he went beyond six was in June. AARON BOONE: Yeah, I mean, we just want him to be as effective for as long as he can be. You're right, plan A, B, and C. I mean, it all kind of depends -- game score, how he's doing. He could pitch well for a couple two or three innings, and because of the way we're lined up and rested in our bullpen, especially with our high-leverage guys, we feel like we have a lot of length out of them tonight, as much as we would almost ever have. But if he's rolling along, we've got a lead, all those things factor into it. I'm not going to put a limit or even an expectation on it. I want him to go out and pitch his game, and we'll see where it takes us.